White earthenware clay designed to be fired to Cone05 (1031C over 8hours), then glazed and fired just like the rest of our earthenware bisque to Cone 06 (998C). 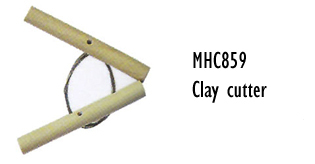 Ideal clay for use when throwing, handbuilding, kids projects, etc. Works perfectly with the Mayco Stroke & Coat colours and the Colorobbia clear glaze. 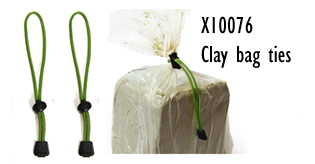 Try applying the Stoke & Coat onto the wet clay, for a convenient and quick project! Segment 4- 60C per hour until you reach 1031C. Then allow to cool for approx 8hours, or until you can unload the kiln by hand. This item is heavy, delivery charge is based on weight and postcode. Enter your postcode at the checkout to find the actual delivery cost to your address. Delivery to most mainland UK addresses is around £20+vat. 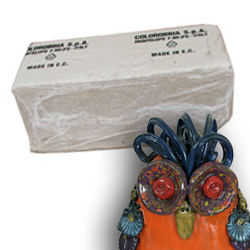 If you order multiple blocks of clay or other heavy items, goods will be sent on a pallet once an order reaches 80kg as it becomes more cost effective. Pallet delivery cost also depends on your postcode, but upto 500kg sent to Zone 1 mainland UK will cost you £54+vat. You are of course welcome to collect. Click here to view instructions on how to make Clay Prints.